For many DJs and remixers, packing gear for a gig always includes the hassle of having a laptop (plus related cables and accessories) in addition to a DJ controller/mixer. More to carry, more to worry about, and more to go wrong; it's not exactly ideal. Well, that changes with Denon DJ's new Prime 4 Stand-Alone DJ system, a 4-deck, 24-bit powerhouse with its own internal multicore processor, 13 DJ FX, time stretching, key matching, and… well, read on. At first glance, the Prime 4 appears to be a familiar face; jog wheels, trigger pads, mixer controls, and faders in a touch-metal chassis make it feel like home for any DJ. However, there's so much more going on over and under the hood. The jog wheels are 6" metal models with touch capacitance, center HD displays, and a customizable RGB light ring. Per side, you get eight trigger pads with Roll, Slicer, Loop, and Hot Cue modes. The mixer is loaded with four full-featured channels, each with 3-band EQ and Sweep FX, and two mic channels with XLR-1/4" combo inputs, volume, EQ, echo, and easy talk-over and punch in/out activation. Impossible to overlook is the gargantuan 10" color touchscreen; it boasts an adjustable angle and multi-gesture control for comfort, visibility, and intuitive interaction with your tracks. Speaking of tracks, the Prime 4 supports a slew of methods for music access. Four USB inputs, an SD card slot, and a 2.5" SATA drive bay accommodate expansive libraries from all sorts of media sources and audio formats (e.g. FLAC, ALAC, and WAV). Easily import content such as playlists, folders, and cue/loop information from iTunes, Native Instruments Traktor Pro, rekordbox, and Serato DJ Pro. You can even connect a USB keyboard to browse your collection with the speed of flying fingers. On the rear panel, you'll find four stereo RCA line inputs (inputs 3 and 4 are switchable between line and phono) and three pairs of balanced XLR outputs. Why so many? Denon decided to bestow the Prime 4 with master outputs, booth outs, and a special stereo zone output. This independent zone output has dedicated level and EQ controls, and allows you pipe a special playlist to a different area, such as an outdoor patio or entryway. If you're also tasked with managing lighting, you'll welcome the presence of the RJ45 Ethernet Link port. Use this StagelinQ-compatible connection to conjure creative lighting and video actions via Soundswitch, Timecode, and Resolume systems (available separately). No matter the event, once you make the Prime 4 your main squeeze, you can leave the laptop at home and hit the road. 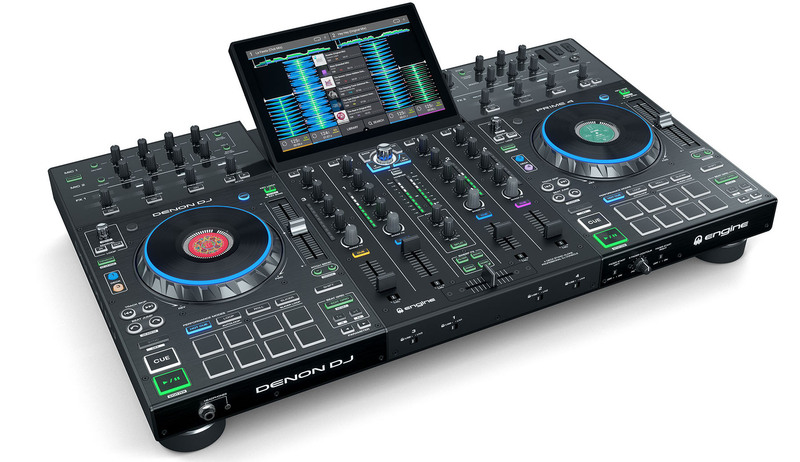 Come to the B&H SuperStore to talk about Denon DJ's Prime 4, or visit our website to check it out for yourself!